Milltek Sport have over 35 years of exhaust development which have led to them developing the ultimate ranfe of performance exhaust systems. Milltek Sport are at the forefront of tuning companies and owners 'must have' list in nearly 90 countries. Milltek Sport exhausts are made using type aircraft grade stainless steel, known for it's high quality and for being less likely to discolour (due to being anti-magnetic). All Milltek exhausts are designed and developed in-house in the UK. Tarmac Sportz are approximately 2 miles away from Milltek's head quarters in Derby so we are ideally placed to supply you with your Milltek exhaust. Buy your Milltek Sport exhaust today from our complete up to date online shop. 10% discounted price off the manufacturer’s RRP (already included in our prices). Milltek Sport has been producing exhaust systems in Britain for over 30 years, and are highly experienced in the manufacture of performance car exhaust systems. A Milltek exhaust system is often on the “must have” list for every performance car enthusiast. Tarmac Sportz stocks a huge range of Milltek Exhausts for wide selection of vehicle manufacturers including Audi, BMW, Citroen, Ford, Nissan, Mitsubishi, VW and more, please select your vehicle from the option on the left. Milltek Sport are an ISO 9001 quality-approved manufacturer and their exhausts are made from type-304 aircraft grade stainless steel. This quality of stainless steel is used throughout their range, it offers high performance whilst being extremely lightweight, corrosion and heat resistant. Milltek Sport has links with various race teams throughout the world including teams in the British Touring Car Championship. Performance to blow your mind, not your ears! Milltek engineer their exhaust systems to have a deep and sporty sound without being too harsh and intrusive, they offer most of their exhaust systems with a resonator chamber which cuts out certain noise frequencies. Milltek exhausts are designed and engineered for low back pressure and high air flow-rate which allows your engine to breath more freely, this in-turn leads to higher performance. 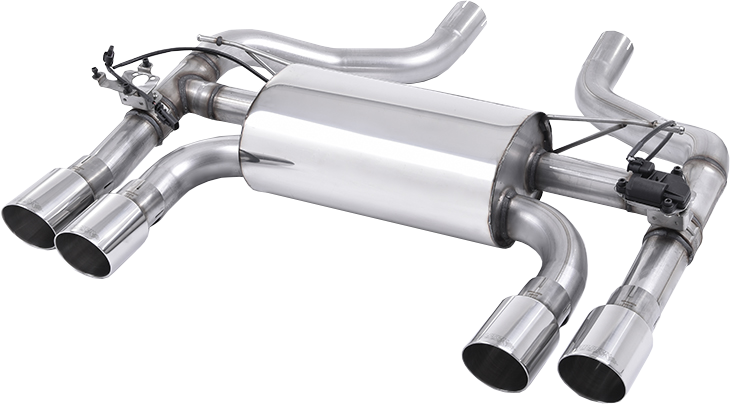 Milltek manufacture the entire exhaust systems, as well as individual components. They have many years experience in producing back boxes, catalysts, manifolds and downpipes as well as tail trims. As an authorised dealer for Milltek Exhausts we are able to offer a 10% discounted price off the manufacturer’s RRP. This has already been included in the prices shown on our website. Contact a member of our team today for expert advice and help in selecting the correct Milltek Exhaust system for your vehicle.